SEATTLE (February 16, 2016) – The 22 CARSTAR Puget Sound collision centers got together last week to help a worthy military family with a donation of a 2008 Nissan Altima as part of the National Auto Body Council’s (NABC) Recycled Rides® program. The vehicle donation was made on Wednesday, January 27. The car was donated by State Farm and was a former fleet vehicle for the company. As part of the process to bring the vehicle to like new condition, the CARSTAR Puget Sound Business group had one of their shops repair a small dent in the hood and replace the front bumper, which was donated by LKQ Keystone. The vehicle’s recipient, Daniel H. DerHammer, was on active duty from January 1996 to November 1998. He served almost three years of a four-year enlistment. DerHammer was injured in August of 1998 while his unit was in NTC Yakima. He was in a HMMWV accident and suffered a broken neck and back. Dan was awarded a 40 percent service connected disability rating. Because of his injuries he has extensive arthritis and multiple conditions which limits how long he can stand and sit. He requires numerous medications to manage the stiffness and pain. But even with his pain, he still volunteers at his church. DerHammer has applied for and been approved for vocational rehabilitation. He will begin an Associate's degree program in Accounting as of January 2016 at Pierce College. He recently had a full hip replacement as an aggravated condition of the damage to his lower back. As the sole bread winner of his family caring for his special needs child and his wife who is disabled, their family has been in financial hardship for the past year. 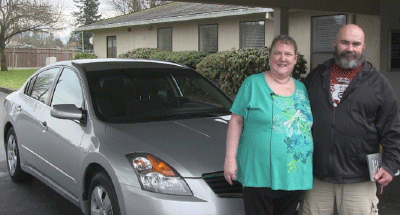 CARSTAR Puget Sound felt that this car will give he and his family the helping hand he needs to start the New Year in a positive way.